A major fire has broken out at the medieval Notre Dame cathedral in central Paris. 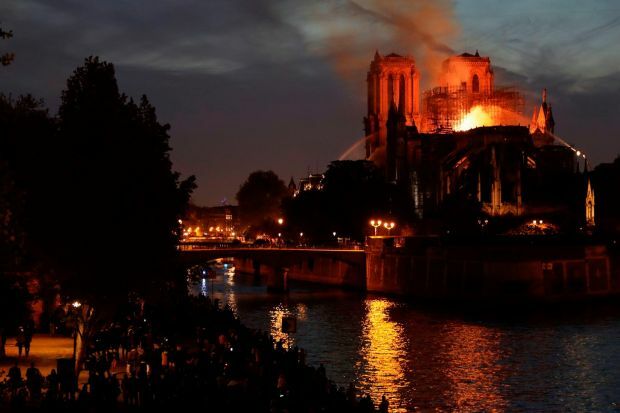 A French firefighter official has said that the structure of Notre Dame has been saved from total destruction but that one firefighter has been seriously injured. The spire of the cathedral collapsed on Monday afternoon and authorities have begun examining the cause of blaze. Renovations were undeway at Notre Dame de Paris [Our Lady of Paris], with some sections under scaffolding. And (if they save them), it's the earliest part. How much I'm hoping they can save the structure from total destruction! It'll never be the same for 20-30 years, minimum. It's not the $ either. milwaukee had a major church fire in 2018. only built in 1870's. 1. Thank goodness for small mercies. Hats off to the brave workers who helped save what they could. But Paris and the French really didn't merit a total loss of this piece of their heritage. Those towers needed to endure. 5. And (if they save them), it's the earliest part. The spire, as iconic as it is, is an added element. I think they will rebuild it, and they'd already removed the statues surrounding it. 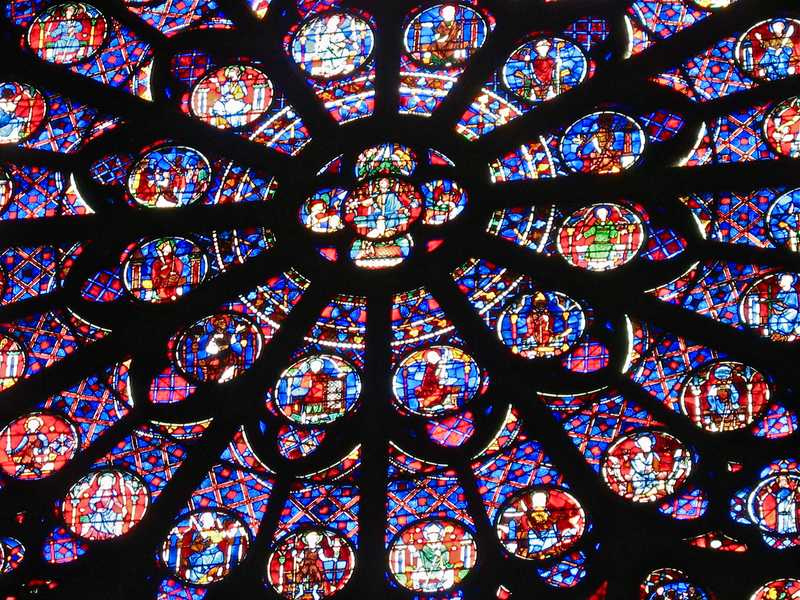 If they do save the beloved towers, it will give Parisians a very rare opportunity to see the Cathedral as it was when it was first built, the way it was in Eleanor of Aquitaine's day, which is a tiny silver lining. Not that I take it for granted, but the French value these things so dearly, I have some hope. firefighter was hurt and we all want him/her to recover! 2. How much I'm hoping they can save the structure from total destruction! I'm sure they're putting their best efforts into doing just that. while the fire was raging through the top floors and up through the roof, it looked as though the entire building would be a total loss. It took the local fire fighters all night long to extinguish the flames. Everyone who saw it while it was burning thought for sure it would never be saved, but the entire stone building itself ended up being okay, although the interior of the top couple of floors had been gutted. So I'm hoping that other than the roof top and the spire, maybe the rest of the cathedral will end up being restorable once the fire is out. Regardless, it's so sad that any part of it was destroyed, along with any of the irreplaceable artifacts inside. Hopefully, some of the artifacts in the lower sections will be alright. I'm optimistic that the cathedral will be restored to its former beauty someday. A prayer to the Apostle Thomas, patorn saint of architects, for an inspired and speedy reconstruction. Thanks to the incredible work of Vassar art historian Andrew Tallon. This will be crucial going forward. 14. 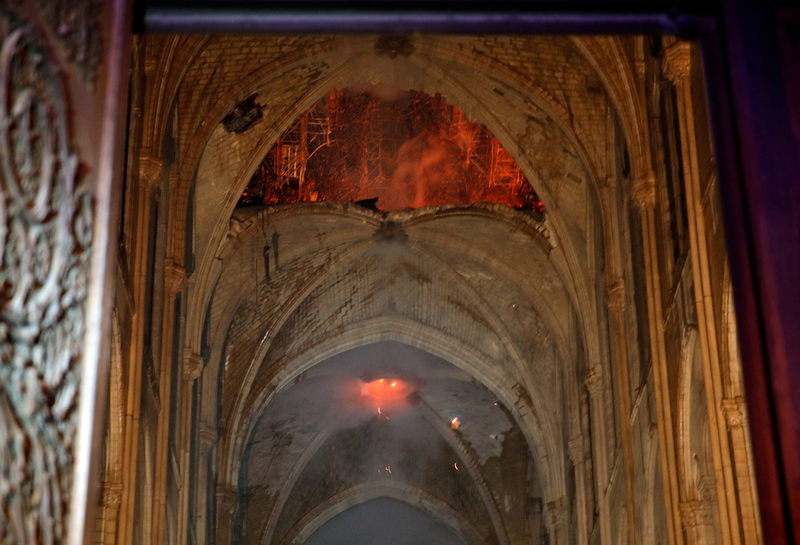 Here's a clearer image of the inside of Notre Dame cathedral, one of the first since the fire. 16. It'll never be the same for 20-30 years, minimum. It's not the $ either. We won't see it done in most of out lifetimes. As a historic French structure protected by numerous laws, it'll take forever to just get all the relevant parties to agree on a reconstruction plan, let alone material selection, architectural upgrades (for very long term building strength) decisions on modern fire-proofing adaptations (internal roof or even external sprinklers, other fire-suppression systems, heat detection sensors and the like). Just the effort to get all parties to agree (tough enough in Paree!) on a plan to START the renovation could take years. Sorry, glad I visited in 2000, but I and many of you will be long gone before the new unveiling in, I'll guess, 2039 to 2049! 17. milwaukee had a major church fire in 2018. only built in 1870's. luckily the bones were brick. they too lost a pipe organ, but i saw the carcass a few months later. some stained glass survived and even some decorative wood by the organ survived and a painting of jesus above the alter was pretty much ok from the photo. luckily the church was lutheran, so not majorly pretty like notra dame. at least they have tons of photos for restoration.